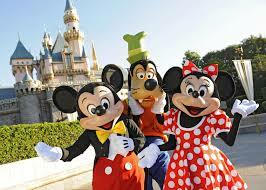 Disneyland Park was opened on July 17, 1955 at California. On its opening 28,000 people attended the event. It was designed by Walt Disney. From all over the world 650 million has been visited here from its opening. In 1930's and 1940's he visited various amusement parks with his daughters. Then he take the idea of Disneyland. It was a theme park . It was a great attraction for children. It is the one of the largest theme park. It is spread in 160 acres. In year 1998 park was re-branded. In year 2013 it host more than 16.2 million people. In that year it was third most visitors park in the world. It is land of dreams for children. Fantasyland is an area of Disneyland park It is for ages.But it is overpriced.Food is also very expensive here.For the facility of the people there are 20 ATMs near Disneyland park . There are very interesting and entertaining things to do like pirates,meet fairy-tale princesses,rocket through the stars explore exotic jungles, dive under the ocean .